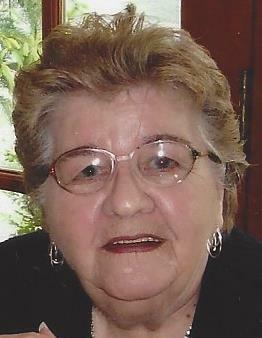 Grace Delaney, (nee Mossuto), 86, passed away on Sunday, July 8, 2018 at Brookdale Assisted Living , West Orange, NJ. The funeral will be from the Thiele-Reid Family Funeral Home, 585 Belgrove Drive, Kearny, NJ on Friday, July 13, 2018 at 9:00 a.m. A Funeral Mass will be offered in Queen of Peace R.C. Church, North Arlington, NJ at 10:00 a.m. Cremation will be private. Relatives and friends are invited to visit at the funeral home on Thursday from 7 to 9 p.m.
Mrs. Delaney was born and raised in Jersey City, NJ and later lived in Bayonne, NJ. She has lived in North Arlington for 30 years. She is survived by her children, Diane Murphy and Richard DiIorio; four grandchildren, Tommy and Alison Murphy and Jonathan and Alexandra DiIorio and three great-grandchildren, Gabriel, Lucas and Solomon. She was predeceased by her husband, Keiran Delaney and her siblings, George Mossuto and Gloria Colello.